A unique project which has taken young South Africans from across the country and trained them to race across the world’s most challenging oceans on the Cliper Round the World Yacht Race, celebrated their achievements in Cape Town this weekend in a busy programme of events at the V&A Waterfront to mark ‘Sapinda Rainbow Day’. 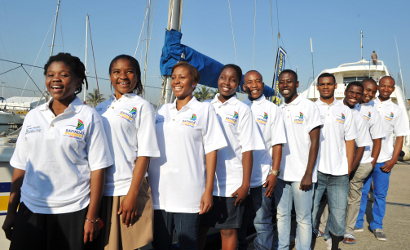 The Sapinda Rainbow project has worked with the Nelson Mandela Children’s Fund (NMCF) to select eight young South Africans aged 18 to 23 who are each sailing one of the eight legs of the Clipper Race to develop their personal and community leadership skills whilst also raising awareness and funds for the Nelson Mandela Children’s Hospital. With some never having seen a boat before let alone stepping on board one, it has presented the youth people with a challenge like no other. Mbongiseni Dludlu a 22-year-old from Johannesburg is the next young person on the Sapinda Rainbow team to take part in the race. He will cross over 4,950 miles of ocean and spend more than three weeks at sea on board the African entry and the team will continue to raise funds to help realise the last major legacy of Nelson Mandela. The Clipper Round the World Yacht Race which was founded by sailing legend Sir Robin Knox-Johnston, the first person to sail solo non-stop around the world in 1968-9 departed from the V&A Waterfront to race nearly 5000 miles to Albany, Western Australia on the 4th of November.